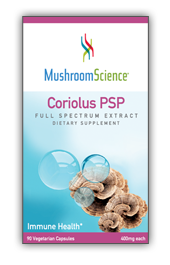 A blend of hot-water extracted Maitake, Agaricus blazei, Reishi, Shiitake and Coriolus PSP used to help maintain immune health. Hot-water extracted Agaricus blazei used for the maintenance of good health. 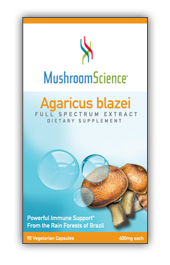 Take 1-3 capsules of Mushroom Science Agaricus Blazei twice a day, a.m. and p.m., on an empty stomach. Hot-water extracted Chaga used for the maintenance of good health. 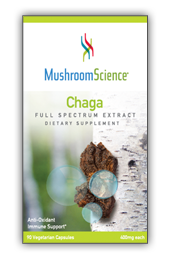 Supplement Facts: Organic Chaga (Inonotus obliquus) hot water/alcohol extract, 15% polysaccharide: 300 mg Ingredients: Vegetarian capsules (cellulose), Inonotus obliquus mycelium, myceliated rice. Adults take 2 to 4 capsules, twice daily (AM and PM), on an empty stomach. Hot-water extracted Coriolus VPS used for the maintenance of good health. Two to three capsules two times daily. 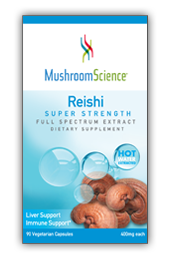 For maximum dose, use no less than 300mg of extract per day with a minimum of 34%-40% polysaccharide content. Take capsules 12 hours apart. 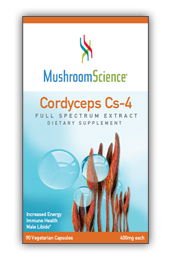 Hot-water extracted Cordyceps senensis used for the maintenance of good health. Two to four capsules four time daily. Hot-water extracted Lion's Mane used for the maintenance of good health. 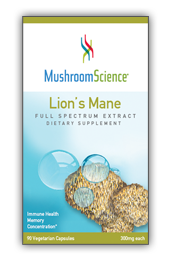 Supplement Facts: Organic Lion's Mane (Hericium erinaceus) hot water/alcohol extract, 20% polysaccharide - 300 mg Ingredients: Vegetarian capsules (cellulose), Hericium erinaceus mycelium, myceliated rice. Adults take 2 to 4 capsules twice daily, AM and PM, on an empty stomach. Hot-water extracted Maitake used for the maintenance of good health. 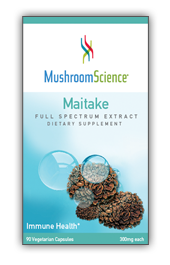 300mg of maitake extract (min 25% polysaccharides). 4 capsules twice daily, AM and PM, or more as recommended by your health care professional. Take on empty stomach. 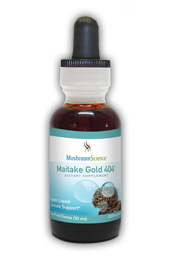 A potent liquid Maitake supplement recommended as an immunomodulator and in the maintenance of good health. Shake well before using. As a dietary supplement take 4 drops twice daily. 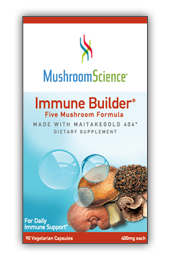 Note: For maximum immune support, dosage can be increased to .5mg to 1.0mg per kg of body weight per day. One drop contains 1.43mg.